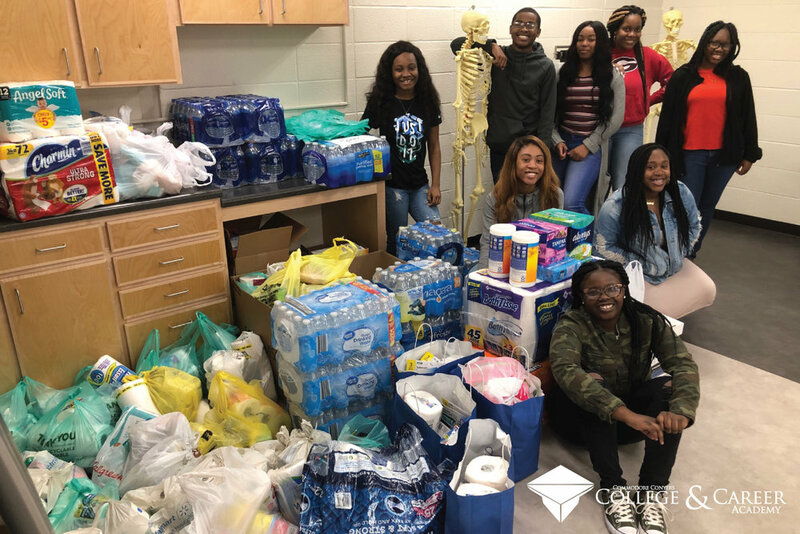 March 18, 2019— Albany, GA— To assist victims of the March 4th tornados that damaged hundreds of homes in the Cairo community, the Commodore Conyers College and Career Academy (4C Academy) Healthcare Science students collected, then delivered supplies and donations to Cairo College and Career Academy last Friday. The mission of the Commodore Conyers College & Career Academy is to produce college and career ready graduates with relevant skills and education and exceptional work ethic who can compete and succeed in the real world. Our partners include local business and industry, the Dougherty County School System, Albany Technical College, Albany State University, the Albany/Dougherty Economic Development Commission, and the Albany Area Chamber of Commerce. In addition, we have partnered with the Calhoun, Terrell and Baker County School Systems.